What is your ideal holiday experience with the kids? For me, I love self-drive holidays because I love the freedom to plan my own travel itinerary. And since travelling with kids isn't exactly without hiccups, I want to be able to tweak our travel adventure accordingly. Which is why a self-drive holiday is about freedom on wheels, as we get to explore places at our own pace. Also, we would not have to worry about figuring out how to get around using public transportation, especially big suitcases in tow. And if you are planning a trip to Japan this year, you may want to consider just that - a self-drive holiday. Sure, public transportation may be adequate for urban areas like Tokyo and Osaka. But we all know the real beauty of Japan lies in its nature with the likes of Hokkaido or Okinawa. With your own set of wheels, you will be able to enjoy coastal drives, scenic mountain routes and visit places where the locals go in Japan! Ok, I know what you are thinking. Choosing the right rental company and vehicle in Japan can be tricky, especially since most of the car rental websites are in Japanese. 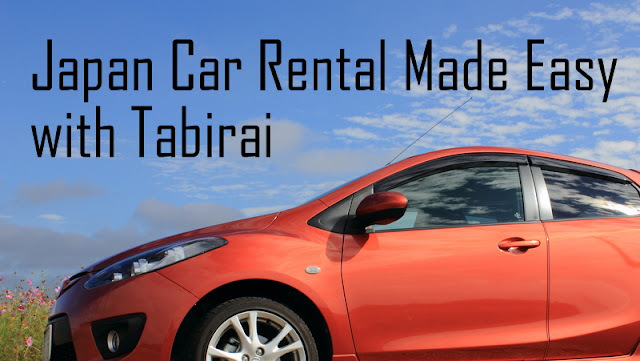 But worry no more, because Tabirai Japan Car Rental is the only car rental company you will ever need if you are planning to self-drive in Japan. For starters, not only does Tabirai Japan Car Rental allow you to search rental cars from major Japanese car rental companies all at once and book it immediately, its website is in English! Super important, because most of the road signs in Japan are in Japanese. So no worries about getting lost! 2. 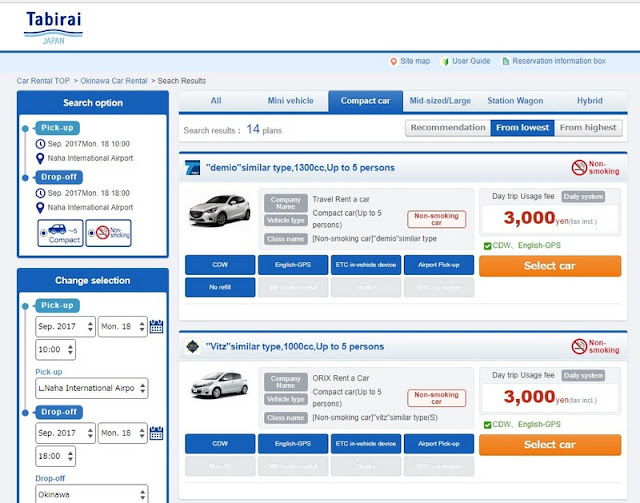 Tabirai only filters cars from major rental companies for overseas visitors at prices which are up to a maximum of 50% off regular prices. Again, extremely important because this means I have more money for sashimi! 3. In addition to rental car charges, basic insurance, collision damage waiver (CDW), English-car navigation(GPS), consumption tax are already included in the booking price. What this means there are no hidden costs or nasty bill increase surprises when you are collecting your rental car. So, how do you get started? 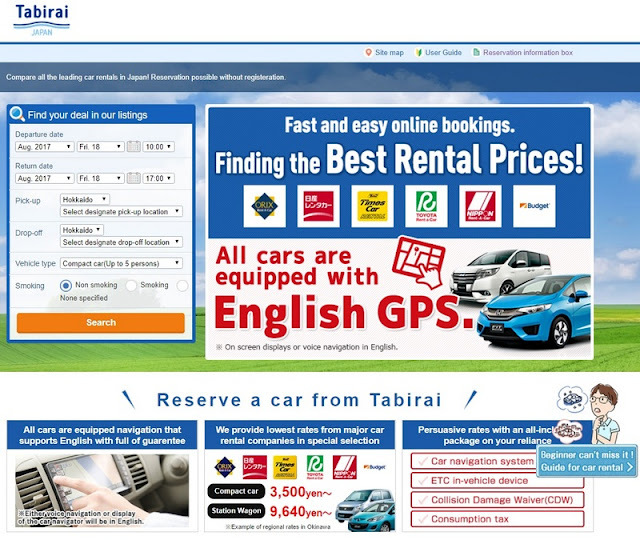 First impressions count, and Tabirai Japan Car Rental's website is simple and every user friendly. 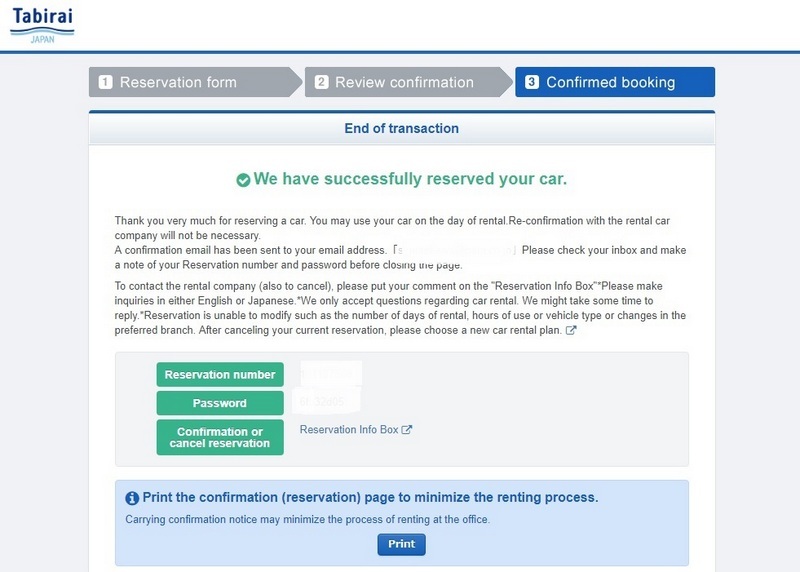 Here's how to book your rental car for your next trip to Japan! Head to http://en.tabirai.net/car/ to get started. 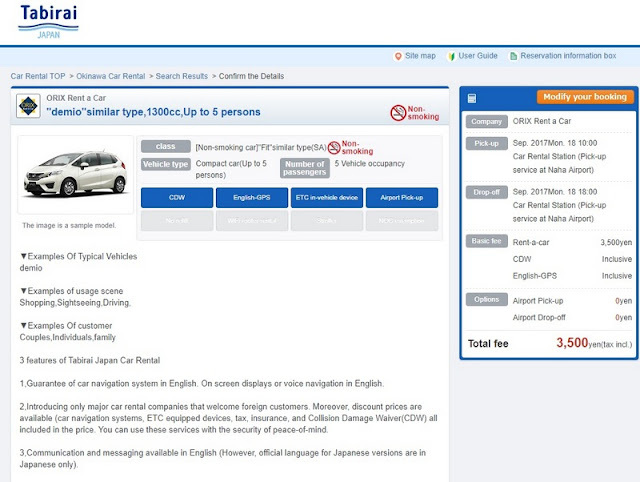 Enter your rental details to search for the best rental cars on offer. You will see a list of vehicles based on your selections. Each listing will give the vehicle make and type, engine size, seating capacity, as well as the rental company name. Of course, the prices are displayed too. 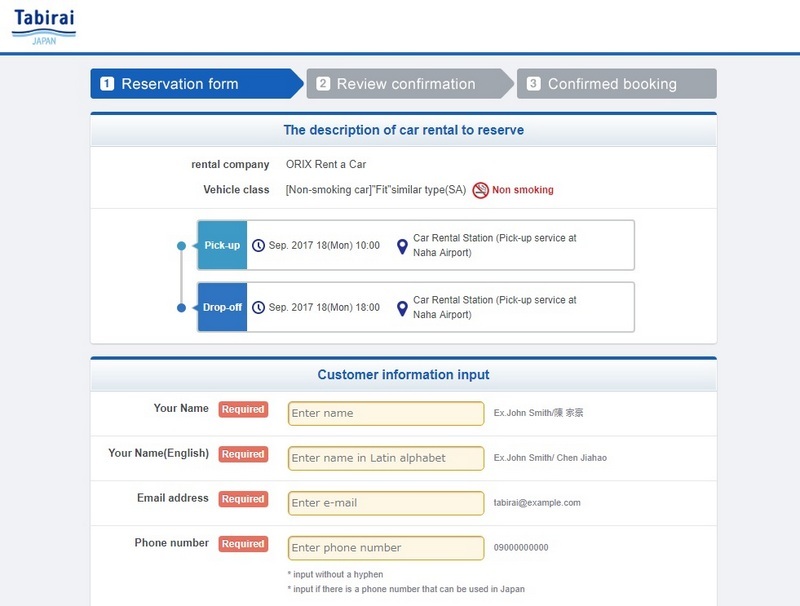 Choose your desired rental car and you will then be brought to a page which shows the full vehicle specifications, and other details. You can see that the collision damage waiver (CDW) and English-car navigation (GPS) are already included in the price. If you are happy with the selection, click on 'Book' and it will bring you to the reservation form where you can fill in your personal details. Click on 'Confirm' and your specified rental is guaranteed. Simply head to rental car company office on your pick-up date and your self-drive holiday is all set! Wait, don't you need to pay too? Of course you do, but you do NOT need to provide any credit card details at the time of booking. Payment is only made at the car rental office on your pick-up date. Do note that credit cards are the recommended mode of payment. 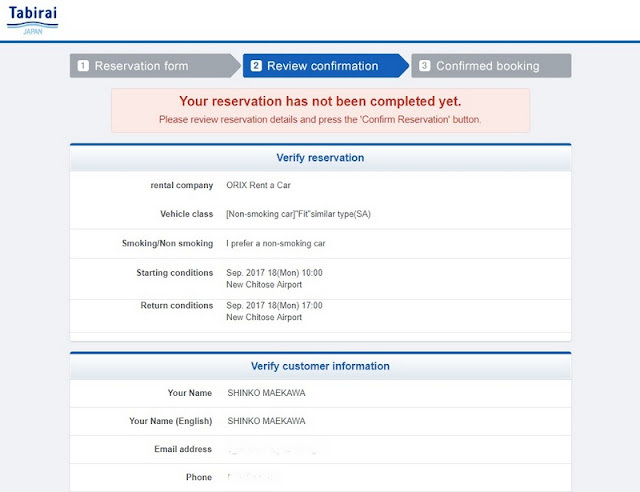 Should you need to cancel your reservation, simply do so via ‘Reservation Information Box’. To be honest, it could not be easier to book your car with Tabirai Japan Car Rental... and at a great price too. Now I have the urge to head to Japan for my next holiday! The nice article helps those people who want to rent a car in Japan. I have enjoyed it a lot while reading it. Thanks for te posting .